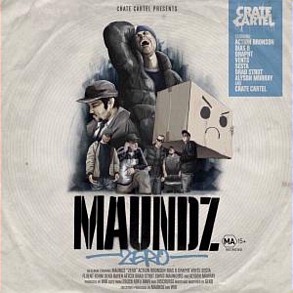 Representing the Crate Cartel crew, Maundz has put together an extremely solid, lengthy effort consisting of 20 tracks. As arguably the label’s most talented MC, Zero highlights his highly aggressive and braggadocios rhymes coupled with the production skills of Wik with mixing done by Geko, creating a sound that’s sonically well put together. After an instrumental intro with some horns and samples setting the vibe for the album, it quickly morphs into a rapid, up-tempo change of pace displaying Maundz’s highly distinctive and effortless flow over open hi-hats and cuts by Adfu. There are plenty of featured artists on here, most notably Brad Strut and Action Bronson on All Quotes. Maundzilla is where things get heavy. This track sees Maundz rap over a grime-style beat with an extremely heavy bass line that sees him using a double-time flow, continually increasing the tempo towards the end. Other guests on the album include Vents, Sesta, Drapht, Crate Cartel, Alyson Murray, and Bias B on the track Take It Back. This is a much more laidback track which sees Maundz and Bias B reminiscing over their childhood days growing up in suburban Melbourne, something that you can never get enough of from Bias. Drapht guests on the track C U Next Tuesday which is a straight out boom-bap hip-hop beat that’s comparable to Dr Dre’s production, particularly his early work with Eminem. The album takes a very strong change of pace with The Flipside, featuring vocalist Alyson Murray. This beat has a strong jazz influence, mainly due to the piano and live sax played by Sam Boon towards the end of the song. Slang Rap is another highlight which has plenty of catchy lyrics. The track sees Maundz rhyme through the song using rhyming slang and witty wordplay and punchlines, all in a highly entertaining and engaging way. Maundz certainly gets marks for creating a diverse album that has many different sounds and influences, thanks to the production skills of Wik. The good thing is that is doesn’t have many vocal hooks which allows for lots of emphasis on his flow and lyrics. Zero is a highly consistent album that will have the listener’s full attention the whole through. You may also want to have a peek at these reviews: Illy, Lupe Fiasco, Seth Sentry.